ST. LOUIS, Jan. 16, 2019 /PRNewswire/ -- As a global leader in the field of poultry nutrition and health, scientists at Novus International, Inc. are constantly seeking new ways to optimize animal performance, maximize sustainability, and help meet customer needs and respond to consumer demands. Next month they will present their most recent findings at the International Production & Processing Expo (IPPE). 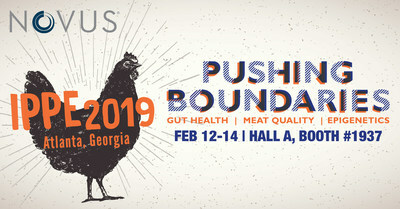 Novus's campaign for IPPE focuses on three areas of poultry science: gut health, meat quality, and maternal nutrition. Four key Novus scientists will present their research on the following topics: measurements to determine soybean digestibility, programs based on the efficacy and benefit of organic acids and essential oils for gut health in an antibiotic-free production program, and the benefits of post-pellet application of fat and enzymes. Held February 12-14, 2019 in Atlanta, IPPE is a collaboration of the International Feed Expo, International Meat Expo, and the International Poultry Expo. In 2018, the annual conference saw more than 7,000 visitors from over 124 countries that represented every aspect of technology, equipment, supplies, and services used in the production and processing of eggs and poultry and those involved in feed manufacturing. Novus International, Inc. is headquartered in metropolitan St. Louis, Missouri, U.S.A. and serves customers in over 100 countries around the world. A global leader in developing animal health and nutrition solutions, Novus International's products include ALIMET® and MHA® feed supplements, ACTIVATE® nutritional feed acid, ACIDOMIX® preservative premixture, CIBENZA® enzyme feed additive, MINTREX® chelated trace minerals, SANTOQUIN® feed preservative, AGRADO® feed antioxidant and many other specialty ingredients. Stratum Nutrition, a division of Novus Nutrition Brands, LLC, focuses on human nutrition through specialty and functional ingredients for manufacturers of foods, beverages and dietary supplements (www.stratumnutrition.com). Novus is privately owned by Mitsui & Co. (U.S.A.), Inc. and Nippon Soda Co., Ltd. For more information, visit www.novusint.com. ©2019 Novus International, Inc. All rights reserved.